magine a world where kids clamour to replace their household pets¦ with monsters! That’s right; goldfish and gerbils are passe. In the new millennium, hideous monsters are all the rage; and there’s a lot to know about raising these carnivorous pets. Good thing 12-year-old Brady Plunkett is up for the job. 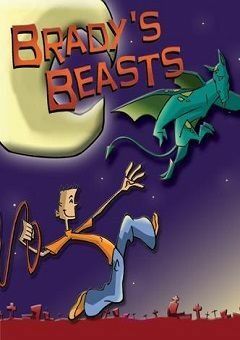 Learn the dos, don’ts, and do-at-your-own-risks of raising a beast from Brady; monster-rights activist extraordinaire! CHARACTERS Brady Plunkett This outspoken twelve-year-old video virtuoso has a passion for misunderstood Monsters everywhere. It all started during a lightning storm when he was barely four. Arlene, his ornery older sister, convinced Brady that the scratching outside the window was not a branch, but a Monster wanting to come in… and eat Brady. Well, it turned out it actually was a Monster, and it actually did want to eat Brady. So, feeling sorry for the hungry beas.